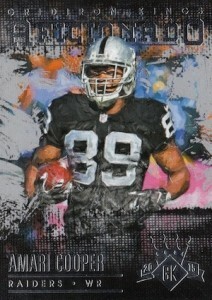 Featuring a colorful design, 2015 Panini Gridiron Kings Football is an artistic release with a strong focus on rookies. 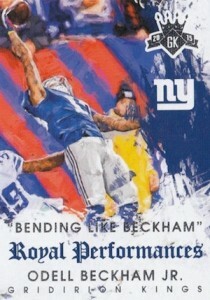 The brand returns after several years in hiatus and is the football cousin to the popular Diamond Kings Baseball line. Each hobby box includes a pair of hits in the form of one autograph and one memorabilia card. The base set kicks things off in 2015 Panini Gridiron Kings Football and there are a variety of framed parallels for both veterans and rookies, including Red Frame and Blue Frame. 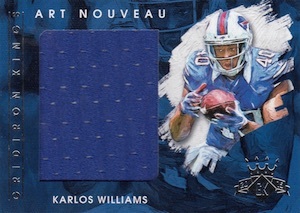 Collectors can find several inserts in the product that each feature parallels as well. AKA honors some of the most iconic nicknames in the NFL. All-Time Stat Kings document the most productive players in the league. Limited Lithos inserts offer another art-focused option. 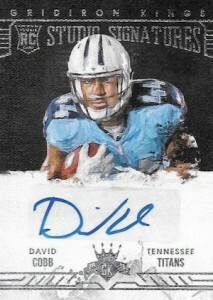 Likely the biggest draw for collectors, the product contains multiple autograph inserts. Stat Kings Signatures contain the biggest current names in the NFL. The base set is numbered to 125 or less, and collectors can also find Red Frame (#/49 or less), Blue Frame (#/25 or less), Green Frame (#/10 or less) or Black Frame (1/1) parallels. Taking that theme a step further, All-Time Stat Kings Signatures include some of the the top overall players and are numbered to 125 or less. Again, Red Frame (#/49 or less), Blue Frame (#/25 or less), Green Frame (#/10 or less) or Black Frame (1/1) parallels are available. 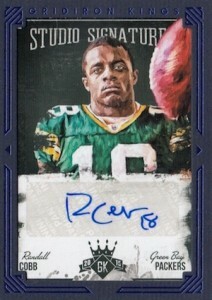 Not just limited to veterans, the rookies are covered with signed cards as well in 2015 Panini Gridiron Kings Football. Rookie Studio Signatures are numbered to 249 or less and are also found in Blue (#/259 or less) and Black (1/1) parallels. Dual Signatures (#/125 or less) pairs two player signatures, including rookies, on one card. Red Frame (#/49 or less), Blue Frame (#/25 or less), Green Frame (#/10 or less) or Black Frame (1/1) parallels offer more choices. 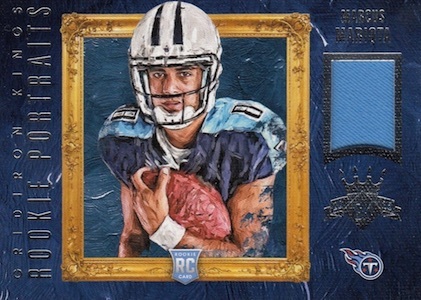 Among the autographed relics, Sketches & Swatches, numbered to 249 or less, celebrate the 2015 NFL Draft class with event-worn jersey pieces and sticker autographs. 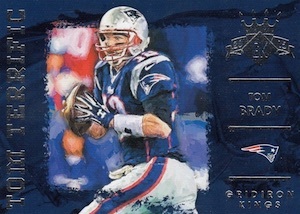 Parallels include Prime (#25) and several one-of-one laundry tag options, including NFL Shield, NFL Player's Logo and Nike Swoosh. Honoring the past, Sovereign Signatures look at former greats. The autographed memorabilia cards are numbered to 249 or less and Prime (#/25 or less) and Laundry Tag (1/1) parallels add more rarity. 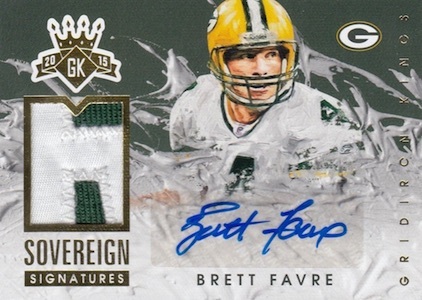 Finally, five memorabilia sets round out 2015 Panini Gridiron Kings Football. Although all the relic inserts were not disclosed, Performance Art cards, numbered to 249 or less, include a jumbo jersey swatch, Prime (#/25 or less) and Laundry Tag (1/1) parallels. Art Noveau memorabilia cards are also included. 2015 Panini Gridiron Kings Melvin Gordon Rookie Auto 2 5 Studio Signatures MINT! 2015 Gridiron Kings DeMARCO MURRAY "RED FRAME Stat Kings AUTO #'rd 04 10 !!! 2015 Gridiron Kings DAVID JOHNSON "RED FRAME GRIDIRON ART AUTO #'rd 10 49 !!! 2015 Gridiron Kings VINCE MAYLE "RED FRAME GRIDIRON ART AUTO #'rd 34 49 !!! 10 cards. View a detailed guide, including side-by-side comparisons. Not all subjects included in each parallel. View the full spreadsheet for specific print runs. 41 cards. Serial numbered #/249. View the full spreadsheet for specific print runs. 19 cards. Card #19 only found in parallels. 18 cards. Serial numbered #/249. Could be the steal product of the year. Good price range and some nice looking cards. The stickers look awful but if it keeps down the price I don’t mind it so much. It’s when they have over $100 price tag and are full of stickers. 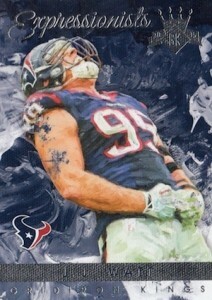 I’m hoping to buy this for Panini’s black friday promotion or my LCS small business Saturday or Cyber Monday deals. I was really looking forward to this product but my initial impression is that it failed to live up to my expectations. I bought 4 boxes. The cards have a cool look and feel to them. However, I really don’t like the different colors of framed cards, none of which are serial numbered except for the black 1/1. 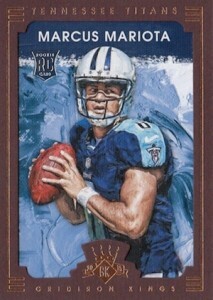 In Diamond Kings (the baseball companion product to Gridiron Kings), you typically got two different color frames. One was not serial numbered and the other was serial numbered to 99. Here, you get three different colors of framed cards and none of them are serial numbered. So each pack usually has 3 framed cards with no serial numbers. This might have some utility if you can get a “rainbow” of framed cards of a top rookie, star player or Hall of Famer, but then again, you will always need the black 1/1 to complete the rainbow. I don’t need 3 different color frame cards of a mid-level star, none of which are serial numbered. It seems like overkill to me. One of the things I was optimistic about with this set was that the hits would be a good mix of veterans and rookies. It’s a huge auto and relic checklist with many veterans and retired stars in both. Even though I know those will be in more limited numbers than the rookies, I was hoping to get at least a couple non-rookie hits in my boxes. Of course, I know 4 boxes is a small sample size, but out of my hits I only got one non-rookie. 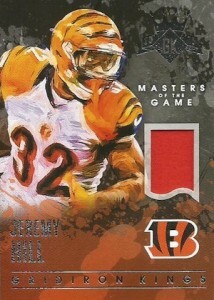 It was a jersey relic card of Andy Dalton. The jersey piece was very small (much smaller than the jersey pieces of the rookies). One of my boxes was missing an auto. Panini’s quality assurance is very good and when this has happened to me in the past, they have send me a replacement card within a few weeks. Still, with a brand new product, it is annoying to have to go through the trouble of filling out a claim online and mailing them the info, etc., just to get the auto that was supposedly guaranteed in my box. My autos were of Todd Gurley, Tyler Lockett and Sammie Coates. Pretty good rookie names. My jersey cards were of Marcus Mariota (a really nice jumbo patch serial numbered to 49), Maxx Williams and Bryce Petty in addition to the Dalton. Obviously I was happy to get the Gurley and Mariota cards. I was hoping for a better distribution of non-rookie hits (maybe just bad luck of the draw in my 4 boxes), I was annoyed with the missing auto, and I was disappointed by the numerous unnumbered frame cards. Overall, I give it 3 stars because I think the price point is good for 2 hits a box with the potential of getting many great names. It’s just not as much of a homerun as it could have been, in my opinion. 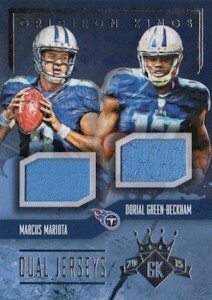 After killing it with Diamond Kings this past summer, I was jacked to grab snared 3 boxes of Gridiron Kings. And, yes, while it is a rookie heavy release, a well-curated roster of veteran signers also made it into the product. So. I pulled a nice but nothing-special T. Yeldon auto /50, a sweet Sammie Coates 2/C-3 break jumbo patch /25, a nifty-keen Jameis Winston 1C auto-patch /25, a Jay Ajayi 1/C swatch /”Can’t Count That High”, and the real show-stopper… an Amari Cooper 3/C-4 break auto patch /10. Man. That’s a really neat card, a PC kinda card, and I didn’t drop a bundle to pull it. And therein lies the real appeal of GKings and its sister product, Diamond Kings; they offer unique and significant cards of thein memorabilia cards, and therefore are a ton o’ cardboard fun to open! Emmitt Smith, Troy Aikman, Jerry Rice, Joe Montana, Bo Jackson, Deion Sanders, Kurt Warner, Earl Campbell, Gayle Sayers, Jerome Bettis, Tom Brady, Richard Sherman…I’m out of breath here. Coupled with a historically significant SuperBowl signature subset and a full suite of rookie mem’, autographed and “patchified” … I find Gridiron Kings to be a contender for “product of the year” honors. Pretty solid product. Love the design for sure!